I don't think I've ever shared a recipe on this blog, due to some strange oversight. I love cooking, especially healthy, spicy food. For years I was vegetarian and love good hearty dishes that would fit that diet, though now I am happy as a meat-eater. I have never been one for excess additives, sugar, dairy or baking -- I generally skip dessert entirely. In future posts I will present recipes and food lore for your enjoyment, based on what my family and I enjoy. Recipes won't be too formal and won't be too complicated. But they will be tasty! Lately I have discovered just how harmful grains are to biological systems unevolved for them. Many people with digestive problems, fatigue and so on often find a sudden improvement once grains and dairy are omitted from their diet. However I am also a believer in moderation and am thankful that rice is the "best" grain (that is, the least likely to generate intolerance). I have always been close to the world of food, starting with weekends working in a Chinese restaurant to pay my way through school. What was made for the patrons was not nearly so interesting as what the cooks made for themselves. Growing up, my uncle had an excellent Indian restaurant in Toronto. Though this unfortunately closed many years ago, my memories are fond. We used to go in the back way and get whatever was easiest for the kitchen to dish up. I once made the mistake of walking in the front door with some friends and then received a lesson in just how expensive hand-prepared Indian cuisine can be! The food preparation business seems to have always been near at hand. My wife's mother is a trained chef and teaches cookery. My brother-in-law currently runs one of the best restaurants in the Toronto business district. If you want incredibly fresh, simple and inventive food (from Southern Italy by way of California) then you owe it to yourself to visit Vertical. The wine list is amazing and the lunch prices more than reasonable. Here in Ireland dining out is expensive and the price in no way corresponds to the quality of food you will get. I am not one to spend a lot at fancy restaurants but in this country, especially, there is no point. 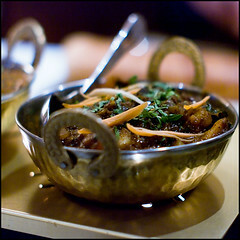 Establishments others rave about have over-cooked, badly spiced and stale dishes. It is impossible to get something as simple as a plain soup, without milk, cream or unnecessary thickeners. Vegetarian dishes will be made with meat stock. The lack of seafood, for an island country, is disappointing. Almost everything is frozen. Thankfully Limerick does have one decent fish'n'chips joint (but only one). For a short while we had one "real" Chinese place, but it did not last. Thai food here is butchered, but that is a trend everywhere; real ingredients are discarded since they do not fit a Western palate. Vietnamese is non-existent and Japanese I would not risk. Too bad, since those are my favourite cuisines. What is good in Ireland is meat. Beef, pork, chicken, duck and especially lamb are first-rate, especially compared with the North American standard (which is horrid, especially in the USA). I can honestly say that I never liked ham until I tried it here in Limerick -- the city is famous for how they prepare pork and rightly so. There are many ways of making "bacon", a single term that has a multitude of meanings in this part of the world. There are also some curious local delicacies, like curry'n'chips, which is simply Chinese style curry sauce poured over potato chips, here made cut large, skinned and soggy -- exactly the opposite of how I prefer them. Curry'n'chips can include more or less onion and even chicken pieces and peas. If you order a meal in an Indian or Chinese restaurant, you are as likely to eat it with chips as with rice, bread or noodles. Yes, even in a fancy hotel restaurant. Don't scoff until you've tried it! A "fake" Chinese stir fry is great with chips. When eating out in Ireland, the best possible meal for the best price is Indian food. So, in my next foodie post I'll say a thing or two about that cuisine. And then cook some for you... virtually of course. Love this post. You have to post more often with your healthy dish. Love your work. Thanks Hin! More articles for sure. i love food posts and i'm such a fun of all these cooking shows. Never tried indian food but will put it on my list. Nice to see that a blog can be more than just a pictures. I guess it great to have something to share.